Jane Eyre: Writer's Digest Annotated Classics (Paperback) | Let's Play Books! "I am no bird; and no net ensnares me; I am a free human being with an independent will..."
One of the most sweeping and enduring novels in English literature, Charlotte Bronte's Jane Eyre has become a beloved classic and a must-read for fans of period romance. Filled with memorable characters, witty dialogue, emotional scenes, social commentary, and intriguing twists, Bronte's novel, written in 1847, still has much to teach writers about crafting exceptional stories. 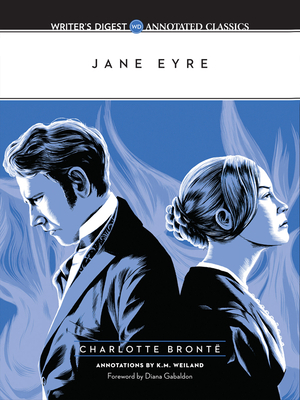 As part of the Writer's Digest Annotated Classics series, this edition of Jane Eyre features hundreds of insightful annotations from writing instructor and author K.M. Weiland. Explore the craft and technique of Jane Eyre through the lens of a writer, and learn why and how Bronte made the choices she did while writing her iconic novel. The techniques learned from the annotations and accompanying study guide will aid in the crafting of your own celebrated works of fiction. K.M. Weiland is the internationally published author of the Amazon bestsellers Outlining Your Novel and Structuring Your Novel, as well as the western A Man Called Outlaw, the medieval epic Behold the Dawn, and the fantasy Dreamlander. When she's not making things up, she's busy mentoring other authors through her award-winning blog HelpingWritersBecomeAuthors.com.